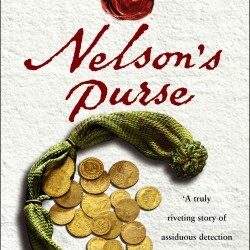 Nelson’s Purse recounts Martyn’s extraordinary discovery of a trove of treasures belonging to Admiral Lord Nelson including the blood stained purse he carried to his death at the battle of Trafalgar. The trove was discovered in a forgotten trunk belonging to descendants of Nelson’s prize agent and confidant Alexander Davison. In the book, with novelist’s flair Martyn tells the story of Davison’s remarkable life: from his humble beginnings in rural England to fortune as a self-made merchant oligarch and finally to his downfall and imprisonment. 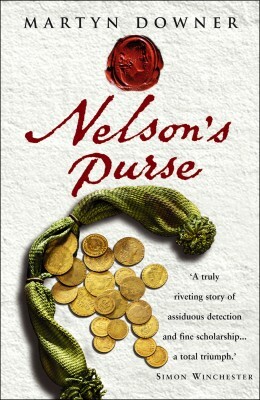 Nelson weaves through the story throughout: from first meeting Davison in war torn North America to the final fateful days before Trafalgar. Martyn Downer makes excellent use of long-lost correspondence to recover the flawed greatness of the titan who conquered Napoleon’s navy but never himself. An epic and tragic story, here told with flair and with a keen sense of the messy majesty of it all.” – JOSEPH J. ELLIS, Pulitzer prize-winning author of Founding Brothers: The Revolutionary Generation and His Excellency: George Washington. William hardly slept; none of them did. The dull ache in his stomach had risen to his throat bringing with it bile and the sour taste of fear. Men had told him about the morning of battle, bragging of their own bravery. They were lying, of course – it was the grog talking – but everyone went along with their swagger. The men who had fought at the Nile or Copenhagen never spoke of it. Now that day had dawned for him, and he simply felt hollow. He was cheek by jowl with a thousand men but felt as lonely as a lost child. He expected his bowels to open, and they did, and to be sick, which he was; but this awful sensation of helplessness in the face of a brutal, random death was startling. His hand shook as he shaved, though it still paused instinctively as the ship rose and fell. William took longer than usual over the task, relishing the mundane routine. It was only when he gazed into his glass and imagined himself dead, his torn body sinking into a crimson sea, that he was, for a moment, overwhelmed by such dread that he had to hold himself from running wildly away. But he couldn’t move and there was nowhere to run to. Only when his spiralling fears glimpsed Elizabeth asleep in London did he relax, clutching the image. His wife did not know what he was facing here, now, today. He was grateful for that. It would be days, weeks even, before she heard whether he was alive or dead. He vowed, if he survived, never to leave her again. William, as a mere servant, berthed in the orlop deck, below the waterline, in the dank, fetid bowels of the ship. He watched as it was cleared for casualties. The loblolly boys were rolling bandages, counting out sponges and busily swabbing down the midshipmen’s table in the cockpit. Beatty the surgeon was arranging his knives and saws, checking their keenness from time to time with his thumb. The men hid their thoughts, each absorbed in his task. William was thankful the edgy heartiness of the night before had gone. He was reassured by the sight of this orderly calm before the looming chaos. More than ever now he wanted to live. In one involuntary movement, as if joined together by an invisible thread, all the men on the deck suddenly paused and glanced up. For a moment there seemed no reason for this. Then William realised that the familiar creaking and thudding sound of the rudder, the heartbeat of his wooden world, was changing. The noise rose to a roar as, heaving slowly at first and then with a sudden lurch, the ship slipped steeply to port to go about. The men clutched the beams above their heads. Beatty’s tools crashed off the table, clattering chaotically across the deck. For several minutes the ship held this position, shuddering painfully, until slowly the deck straightened and the lanterns hung straight again. High above the spot where William stood, the wind grabbed the vast sails of the ship and the familiar rolling sensation again surged through his body. His Lordship had turned them towards the enemy.